H.J.Hansen Wine Ltd. is founded in 1829 and still family owned (Danish family) which is quite unusal in the wine business today. 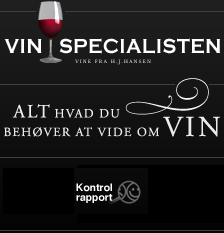 We are regarded as one of the leading wine retailers if not THE leading wine retailer in Denmark when it comes to quality wines. Experience and tradition play a main role in this more than 180 year old success story, although foresight and vision are cast for support. Through the years, the key words have remained the same: QUALITY, CHOICE AND SERVICE. We import wines from all over the world through very close contacts/ relationships with a very well developed producer network with the very best wines from f.ex. France, Italy, Spain, Chile, Argentina, the US, South Africa, Australia and New Zealand. We supply the hotel, restaurant and catering sector as well as the business-to-business sector and private customers. Private customers are mainly supplied through our own two H.J. Hansen shops in Odense and Copenhagen and through the voluntary shop chain Vinspecialisten where we have almost 50 shops all over in Denmark.